Mumbai: Who needs studio sessions when music made over the internet sounds this good? People have been making tracks together online since the 1990s, but VAN DUO have made it into a serious art. The pair have never met but have managed to forge a distinctive sound that blends progressive, techno and house in brilliant combination, with fans including Pete Tong who has supported them on his BBC Radio 1 show. The title track is a warm, bouncing slice of progressive house propelled by fizzing synth chords and plump bass, building slowly through atmospheric effect and classy percussive grooves. Rewire channels classic techy stabs, thick 808 bass tones and an array of melancholy melodies to create a brilliantly atmospheric track that will be right at home in a huge range of DJs’ crates. Together they form an excellent EP that shows a real sense of skill and a maturity of sound. They play both as a live act and as DJs, and will travel from their respective homes in Lithuania and New York to play this summer alongside STMPD boss Martin Garrix at Ushuaïa Ibiza (August 2). With more releases planned alongside Garrix and STMPD this year plus a remix for Lost Frequencies, they are very much set for the big leagues. 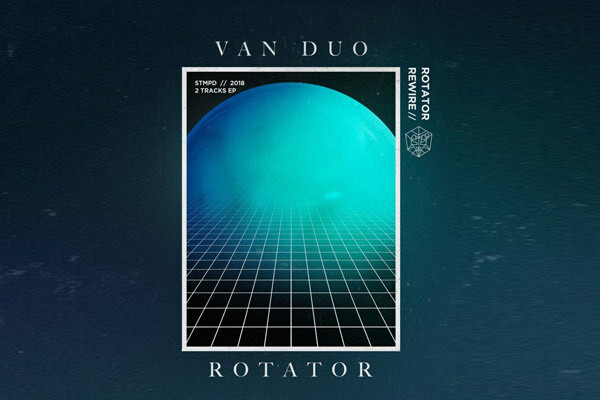 Van Duo Rotator EP is released on STMPD RCRDS on 29 June.